It is inevitable for expectant mothers to find it hard to sleep comfortably during the second and third trimester of the pregnancy. Having to pee every two minutes, dealing with anxious thoughts about the developing fetus, side-sleeping, and even feeling that amazing but oh-so-painful kick from inside can make a woman feel restless and stressed during a time when sleep is of utmost importance. A body pillow is designed to provide support while you sleep. They have been specifically designed to benefit those with back or neck strains. The pillows allow them to relieve their pain, improving posture and aid a swift recovery. These pillows come in many different shapes and sizes and tend to be filled with either feathers, memory foam or buckwheat hulls some also contain herbs. What’s inside a Body Pillow? If you are heavily pregnant, you must have searched far and wide for the best body pillow to resolve your sleeping problem. There are a number of products that promise uninterrupted slumber sans the neck pains the morning after. One such product is the Leachco Back ‘N Belly Contoured Body Pillow. Users who have experienced this product all rave that they no longer feel hip and back pains as well as stiff necks after using this body pillow. No matter how many tosses and turns you do while sleeping, this pillow promises a long, peaceful and comfortable sleep. The Leachco Back ‘N Belly Contoured Body Pillow is especially designed for soon-to-be mothers who need relaxation and comfort but just could not find them because of numerous issues like back pains and stiff necks. However, this unique pillow is also good for individuals looking for ways to alleviate body aches and stress. The Back ‘N Belly’s U-shape and inner contours are designed to follow the natural curved shape of the body, making it unnecessary to shift positions. This is ideal, especially because pregnant women are highly advised to sleep on their left sides to promote blood circulation to the baby. Its shape is designed to relieve hip and back pains, give total support promote proper body alignment. It also allows the sleeper to elevate the head and prevent heartburn, a common condition for expectant mothers. The Back ‘N Belly Pillow provides comfort and speeds up a woman’s postpartum recovery through proper posture and quality shut-eye. It also helps prevent carpal tunnel syndrome, sciatica, gastric esophageal reflux disorders and even nasal congestion. The Leachco Back ‘N Belly Contoured Body Pillow comes with an especially designed cover case that you can easily remove it when it needs to be cleaned. Another good product that promises a good night’s sleep for expectant mothers is the Leachco Snoogle Total Body Pillow. Just like the Back ‘N Belly, it is 100% compatible with a pregnant woman’s body shape, maintaining the safety of the developing baby while mommy gets her own share of a painless quality slumber. Leachco Snoogle Total Body Pillow is not just for sleeping but for much more. 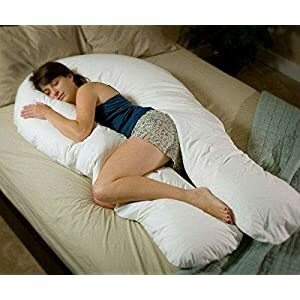 In fact, this body pillow can also be used to get into a comfortable position while on the couch, watching television or knitting baby’s first pair of mittens. It elevates the baby to its required height, giving support both to the tummy and back, making it easier for the expectant mother to relax. The unique ergonomic curving design of the Snoogle Body Pillow also helps prevent sciatica and lower back pain by providing full back support. Tucking the bottom curve in between the legs provides additional support, reduces back pain and aids with temperature control. Expecting a child comes with a mix of unforgettable, exciting, often times uncomfortable moments. These Leachco products help make every waking moment more than just bearable, but enjoyable as well. In the range of the “I wish” expectant mothers pray for, a good night’s sleep makes it to the Top Ten. Thanks to Leacho Body Pillows, it becomes a reality. On the the other hand, the Comfort U Total Body Support Pillow is a lot more expensive than the Snoogle pillow. However, plenty of pregnant women found a lot of great benefits in the Comfort U Body pillow. Unlike the Snoogle, The Comfort U Body pillow has a U-shape design and it goes down on both sides of your body. It allows you to stretch out and cradle your entire body in support and comfort. Just like the Snoogle, the Comfort U Body can help reduce back pain. The unique Fusion Fiberfill separates the Comfort U Body pillow from the rest because it is made from a polyester polymer with extremely high heat resistance. The strands are arranged in clusters in such a way that lumps are avoided and a comfortable sleeping surface is provided. Designed by Jean Kelly who once suffered many sleepless nights because of her chronic joint and muscle pain, the Comfort-U is based on the principle of using cocoon like pillow. With this, you are sure to sleep like a baby. This body pillow is not only ideal during pregnancy. You can continue using this after giving birth. This is suited for your sedentary activities like watching TV, playing and reading to your kids or just singing to your baby to sleep. You can position it between your knees, prop it up for additional head and neck comfort, or just put it on your back. It is so flexible you can actually use it anyway you like. The fourth body pillow for pregnant women worth mentioning is Today’s Mom Cozy Comfort Pregnancy Pillow. Today’s Mom is made from 50% Polyester and 50% Cotton. It weighs around 10 pounds and has the dimensions of 23 x 14 x 16 inches. You can purchase this pregnancy pillow with a color of your choice; celery, sky blue, almond, cream, white, and espresso. Like the Snoogle Chic it has an easy to remove outer cover that can be washed just as easily and put back on. The makers of Today’s Mom have designed this pregnancy pillow to have a curved shape with shoulder support that contour or fit along your shoulders and the natural curves of your body to help you sleep better. The full back support allows you to comfortably nurse your baby while resting. Additionally, after concerns raised by women on the lack of belly support in other pregnancy pillows, the makers of Today’s Mom ensured that their pregnancy pillow had a support for a mother’s belly to rest on so it will allow you to sleep well on your side by giving you great belly support. And if you frequently get sore feet, then Today’s Mom may just be the pregnancy pillow for you as it allows either your upper or your lower body to be elevated. 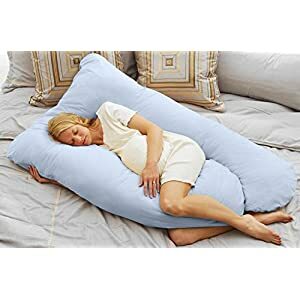 However this pregnancy pillow may be better suited for taller women as the pillows can be a bit overwhelming if you’re of a smaller frame. Body pillows can be made of down feathers, memory foam, buckwheat or plastic materials (such as the air beads in the Sobakawa cloud pillow). A down feather pillow will feel the most comfortable but the memory foam or buckwheat pillow are all made with harder and firmer materials. A firmer pillow is the better option for those with spinal problems. A memory foam pillow adjusts to the shape of your back (in the case of a husband) or your head and your neck, so that you will sleep in the best possible position. A buckwheat pillow is excellent for back or neck pain or injuries. The pillow contains buckwheat seeds that move around and conform to the shape of your neck and your head. This type of pillow is especially good for sleeping problems, neck tension, posture problems and reducing snoring. A popular alternative to a buckwheat pillow is the Sobakawa cloud pillow. The Sobakawa cloud pillow is filled with air beads that provide extra support for the head and the neck. The Sobakawa cloud pillow air beads move around and conform to the shape of your head while you sleep. Whatever the materials, a good body pillow can provide support, comfort and pain relief. Having my wife go through those wonderful, tough, crazy, weird, lovely, charming and endless emotional nine month period was a great time for both of us. We have been preparing for it, for a long time and all that preparation finally paid off. Though, other than the basic things like her maternity dresses, diet, baby clothes and keeping the car always ready for a quick getaway to the hospital, in case of an emergency; we did one more thing. This was kind of crazy, but I love my wife and the way she was carrying our first child, so it was all worth the effort to get one of the best pregnancy pillow. It comforted her immensely throughout her period of pregnancy as well as in nursing the baby for the first couple of months without any difficult. It made me realize that more would be parents and people in general need to know about this wonderful body pillow. Who knows, how comfortable and life changing it could be. Type of Pregnancy Pillow – There are many varieties of pregnancy pillows and one may choose it depending on her requirement as well as future requisites. There are some that are made of pure cotton fibers, while some are made of polyester, which is again very easy to maintain. However, once bought, there is very little one needs to do other than getting the best pregnancy pillow covers to remove, wash and then use again. Sometime, one may also wash the pillow or clean it with special tools so would be mother or the child and mother; may not suffer from any dust related allergies. Few firms make these pillows on order and these custom made pillows are much better for many people, with special needs. Some body pillows are meant for pregnant women, while some are meant for people with back problems or shoulder or some kind of specific physical issue that requires them to use them. Obstetrician Recommended – Obstetricians are the experts who look after a woman in her pregnancy period and take care of any anomalies or medical difficulties that may occur in those 9 months. These specialists recommend that a woman carrying a baby must not sleep in an improper position because that may harm the fetus if any pressure occurs onto him. In order to resolve this tricky situation, they advise that one must use best pregnancy pillow to sleep. These support the entire body, especially the belly and the back, which takes most of the pressure that an increased weight has been putting on it. 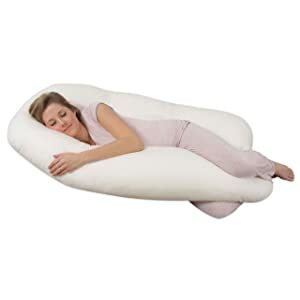 Investing in an excellent body or pregnancy pillow is the first wise decision made by a would be parent. Upkeep – A pillow cover should be used and it must be kept away from dust because it’s a huge sized accessory and it may accumulate a lot of it, in a long period of time if left unattended. The pillow cover must be removed and washed regularly and used accordingly. When the pillow is not in use, then it should be cleaned and stored in a a place that’s dry and absolutely clean. Some pillows can be washed as well, which makes them a favorite choice for many to buy and use. Features – Since these are not at all a perishable item and they tend to be used for years by everyone, once their main purpose is met. They are comfortable to use by someone who needs additional support to keep his back, belly, legs, hips, head, shoulder, neck and hand; free from pressure and stress. The huge size makes it convenient to use as a pillow, body pillow and support apparatus that’s cozy and comfortable. These can be cleaned, decorated and reused again and again. The cotton pillows can be recycled and used. How one utilizes it, expands its features or restricts them. Cost – Though, one may think that since its size is big, it should be costly. Yes, few of the best pregnancy pillow are costly, but one may also find a good deal over the internet. Sometimes, an Obstetrician recommended dealer gives a good discount on a heavily priced pillow, which is definitely a good deal. However, it is advised that one must never compromise on a body pillow if it’s being bought for a pregnant woman. Well, that’s all I wanted to discuss with you for now. I know, my experience with the best pregnancy pillow is overwhelming because it made my wife very comfortable and hence, I have an endless praise for this product. However, if you could also advice anything peculiar about this product, then it would come handy for many more people. Please do write what you think about it!